It’s smarter to be bullish than bearish on BlackBerry. Shares of BlackBerry (NYSE:BB) tumbled 9% on June 22 after the company reported its first-quarter numbers. But those numbers easily beat analyst estimates and indicated that BlackBerry's turnaround was finally paying off. BlackBerry's non-GAAP revenue fell 11% annually to $217 million, but that beat expectations by $7.4 million and marked the company's most moderate decline in years. It posted a non-GAAP profit of $0.03 per share, which was up a penny annually and represented the company's seventh straight quarter of non-GAAP profitability. Those numbers were encouraging, but BlackBerry's stock remains down nearly 5% for the year. So today I'll explain why BlackBerry could rebound later this year. CEO John Chen, who took the top job in 2013, gradually phased out BlackBerry's dying smartphone business and invested in the expansion of its enterprise software portfolio. It completely halted the production of its own smartphones in 2016, then licensed its brand to Chinese tech company TCL to generate higher-margin licensing revenues. BlackBerry's core software products include BES (BlackBerry Enterprise Server), a platform that helps companies monitor their employees' mobile devices, the enterprise messaging app BBM (BlackBerry Messenger), various cybersecurity solutions, and QNX, the world's most popular embedded OS for connected vehicles. Investors often gauge BlackBerry's growth with two metrics: the total growth rate of its software and services revenue, and the weight of that revenue on its top line. Those figures have held steady over the past few quarters. *Non-GAAP. Source: BlackBerry quarterly results. A growing percentage of BlackBerry's software and services revenue is also recurring, which indicates that it's retaining its customers. 86% of its software and services revenue was recurring last quarter, compared to just 79% in the prior year quarter. Chen believes that percentage will exceed 90% "within a year." For the full year, BlackBerry expects its software and services revenue to rise 8%-10%. That sounds like a slowdown from its 14% growth last year, but the forecast uses the new ASC 606 standard, which changes how subscription revenues are recognized. A more accurate measure of BlackBerry's software and services growth would be through its billings, which are still expected to rise by double digits this year. The company also expects its non-GAAP earnings and free cash flow to be positive for the year. 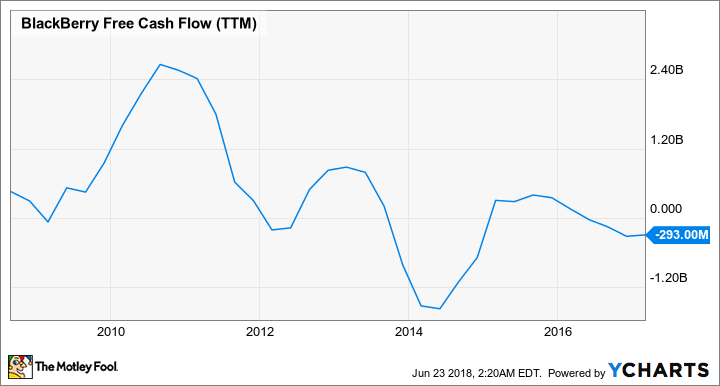 That would mark a remarkable recovery from its negative free cash flow in previous years. 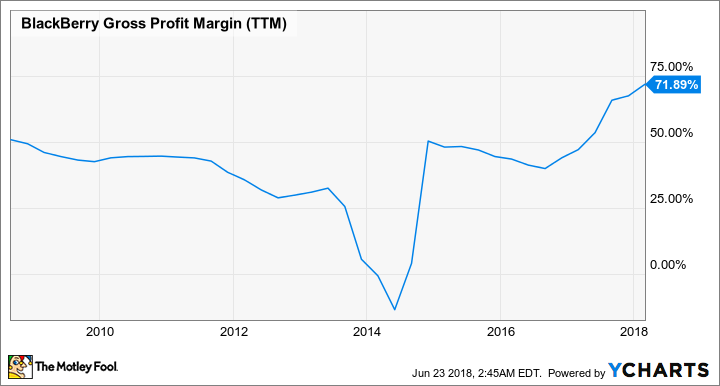 BlackBerry's decision to pivot away from lower-margin hardware toward higher-margin software also boosted its gross margins to historic highs. That figure hit 76% during the first quarter. Another pillar of BlackBerry's turnaround is the monetization of its patent portfolio of over 44,000 patents. Its "Licensing, IP, and other" revenues from TCL and other deals (which are excluded from its recurring revenue figure) nearly doubled year-over-year, and accounted for almost a third of its software and services revenue for the quarter. To maximize that unit's growth, BlackBerry is suing a wide range of companies -- including Nokia, Cisco, Facebook, and Snap -- to squeeze out more licensing revenues. Wall Street expects BlackBerry's revenue to dip 8% this year, but eventually rise 10% next year. BlackBerry's stock might seem pricey at seven times this year's sales and six times next year's sales, but I think many bigger tech companies could be interested in a buyout if BlackBerry's sales growth finally turns positive. Last year, Citron Research stated: "When Wall Street shifts its frame of expectations toward the future, and gets over their legacy business, watch out." Citron, which is better known for shorting stocks than supporting them, cites its automotive OS QNX as BlackBerry's most attractive asset. Natural suitors could include Intel (NASDAQ:INTC), which is heavily invested in the connected car market via its acquisitions of advanced driver assistance systems (ADAS) maker Mobileye, computer vision chipmaker Movidius, and numerous other start-ups. NVIDIA (NASDAQ:NVDA), which has a first-mover's advantage in the automotive market with its Tegra automotive chips and Drive PX platform for autonomous cars, would also benefit from bundling QNX into its ecosystem. Microsoft (NASDAQ:MSFT), which lost the automotive embedded OS market to QNX, would be another likely suitor. The rest of BlackBerry's enterprise software portfolio could also be neatly integrated into Microsoft's other cloud, security, and enterprise mobility services. BlackBerry's low enterprise value of $4.3 billion would make it a fairly easy buyout for all three companies. BlackBerry's turnaround isn't guaranteed yet since it still faces plenty of competitors in the enterprise software and services space. But I'd rather be bullish than bearish on BlackBerry since expectations for the company are so low, and the company plays in a space that's expected to only get bigger.